A photo of the flexible transparent conductor made from a UTMF. Photo: ICFO. 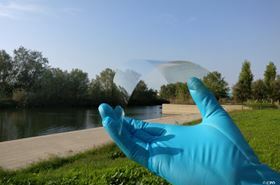 Transparent conductors are one of the key elements of today's electronic and optoelectronic devices, including tablet displays, light emitting diodes, photovoltaic cells and smart phones, which all tend to use the semiconductor indium tin oxide (ITO) as their transparent conducting material. Nevertheless, even though ITO possesses several exceptional properties, such as a large transmission and low resistance, it is expensive to produce, needs to be processed under high temperatures and lacks mechanical flexibility. An intensive effort has been devoted to finding alternative transparent conducting materials that could replace ITO, with a particular focus on more flexible materials. While scientists have investigated materials such as aluminum (Al)-doped zinc oxide (ZnO), carbon nanotubes, metal nanowires, ultrathin metals, conducting polymers and, most recently, graphene, none of these materials possess all the necessary properties to replace ITO. Ultrathin metal films (UTMFs) can present very low resistance, but their light transmission is also low unless antireflection undercoat and overcoat layers are added. This was the approach adopted by Valerio Pruneri and his colleagues at the Institute of Photonic Sciences (ICFO) in Barcelona, Spain, to develop a novel room temperature-processed multilayer transparent conductor. By optimizing the antireflection properties, they were able to obtain high optical transmissions and low losses, with large mechanical flexibility. They report their results in a paper in Nature Communications. In their study, the ICFO researchers applied an Al-doped ZnO overcoat and a titanium dioxide undercoat with precise thicknesses to a highly conductive ultrathin film made of gold. By using destructive interference, the researchers showed that the proposed multilayer structure displayed an optical loss of just 1.6% and an optical transmission greater than 98% at visible wavelengths. This new UTMF also boasted an electrical resistance four times lower than that of ITO and superior mechanical flexibility. "We have used a simple design to achieve a transparent conductor with the highest performance to date and at the same time other outstanding attributes required for relevant applications in industry," said Pruneri. This story is adapted from material from ICFO, with editorial changes made by Materials Today. The views expressed in this article do not necessarily represent those of Elsevier. Link to original source.